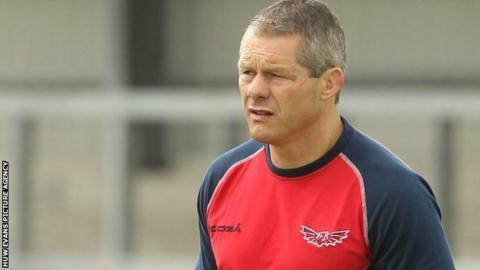 Scarlets defence coach Byron Hayward has signed a new contract extension with the region until the end of the 2017-18 season. The former Wales fly-half joined the region in August 2014 after previously coaching the Wales Under-20 side. In October, Scarlets head coach Wayne Pivac also signed a new two-year contract until the summer of 2018. "I'm grateful to Wayne for allowing me to do my job from day one," Hayward told the Scarlets website. "I'm very fortunate to work with a very honest and hard-working group of players. Defensively, we still have a long way to go but the potential is exciting." General manager Jon Daniels added: "The addition of (Hayward's) signature, following on from the news that we have retained Wayne's services, shows the coaching staff's eagerness to continue to develop this current group of talented players." Scarlets currently lie second in the Pro12 table, two points behind leaders Connacht after eight matches of the season.